Some time ago, I received the book Modern Homebrew Recipes by Gordon Strong as a gift. As I browsed through it, I found Strong's recipe for a Classic Blonde Ale. Strong says this is one of his go-to summer beers and that he doesn't like to make it overly aggressive or strong. His recipe meets the BJCP guidelines for the style and sounded good. I decided to make it. A local homebrew shop provided all the necessary ingredients, but did substitute one as noted below. This recipe was brewed using iMake's The Grainfather RIMS system. Per The Grainfather manual, I put 4 gallons of water into The Grainfather along with the PH Stabilizer and had it heat the water to 151F. All the grains were added, along with 0.15 ounces of Citra pellets, and the wort was recirculated through the grain/hops bed for 90 minutes. After the 90-minute mash time, the temperature was set to 167F. The mash spent 10 minutes at this temperature before the grain basket was removed. The grain was sparged with 3 gallons of water at 167F. Wort entered the fermenter at approximately 64F, which was ideal for the yeast. The yeast was pitched when the packet showed swelling and an airlock was then installed. Using BeerSmith, the pre-boil gravity for this beer was estimated to be 1.042. I managed to achieve 1.045. The final gravity is estimated at 1.048, which I achieved at the end of the 90-minute boil. Approximately 4.5 gallons of wort made it to the fermenter. The rest stayed in The Grainfather kettle along with the trub. The fermenter was sanitized using Star San and topped with a standard canister style airlock filled with Star San. About 24 hours after pitching, the airlock on the fermenter bubbled every 20 seconds or so. At the 48-hour mark it was bubbling approximately every second. It sounded a lot like a coffee maker if you stood close enough. At 36-48 hours, the bubbles were down to every 3-5 seconds. A week later the bubbles slowed to about every 30-45 seconds. I take it that the London Ale III yeast is a little bit of a slow starter but gets going pretty quickly. I am fortunate in that the heat generated by the fermenting yeast and the lower ambient temperature of my basement kept the beer in the 64-66F range (at least when I've checked on it). I haven't had to resort to heating or chilling yet. Per the original recipe, this beer will ferment at approximately 65F for two weeks or until its final gravity of 1.012 is achieved. It will then be bottled and conditioned for two weeks or more before serving. The recipe is expected to finish at 12.1 IBUs, 5.6 SRM color, and 4.8% alcohol by volume. Final yield was a 64-ounce growler, 10 12-ounce bottles from a gallon that was separated and dry-hopped, and 20 bottles (mostly 22-ounce size) that were not dry-hopped. It should be ready to drink around March 10, 2016. I'll add more notes at that time. This brew actually went off without a hitch. Finding Carahell malt and whole hops in the varieties called for in Strong's original recipe proved difficult locally. If I did this beer again, I'd probably order the Carahell grain online along with the whole hops, and try to source the rest locally to support the local home brew shops. For this brew, The Grainfather performed as designed and generated a wort that was at or above the required gravity for the recipe. I wouldn't change anything about how that part of the process went. Cleanup went relatively quickly as well. Early taste tests based on a force-carbonated sample were underwhelming. Don't get me wrong, it was very drinkable. I finished a growler full in a single session. It's just that I think I expected more from it. It was well balanced between the malt and hops, but wasn't substantially better to me than some off-the-shelf macro brews. Perhaps I didn't get something right in the recipe, or perhaps the Carahell malt makes a huge difference. I don't know. As an experiment, I took one gallon of the beer out of secondary and dry hopped it with Emerald (Smaragd) hops for three days. This yielded 10 bottles of 12-ounce size. I'll be back to update this when the beer is finished. It also includes many (if not all) of their annual special release "AB" series of beers. Each recipe is given with a description of the beer, the basic information like gravity and alcohol content, ingredients and amounts, food pairings, and brewing tips. 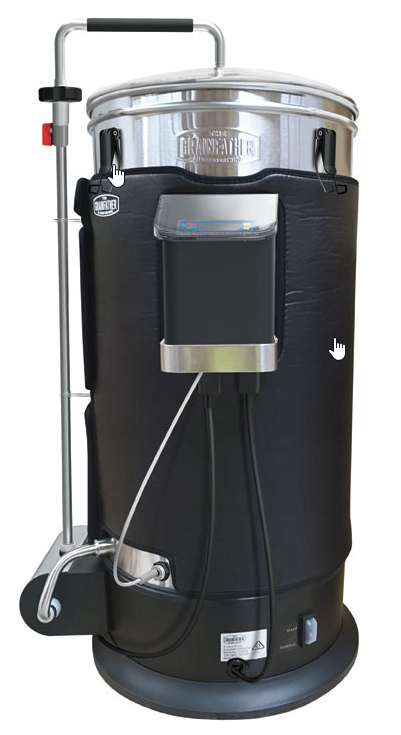 As I've mentioned several times on the blog, I acquired iMake's The Grainfather RIMS brewing system in August 2015 through their Kickstarter campaign that began in March of that year. The system and its excellent counter flow wort chiller is pictured at the left. 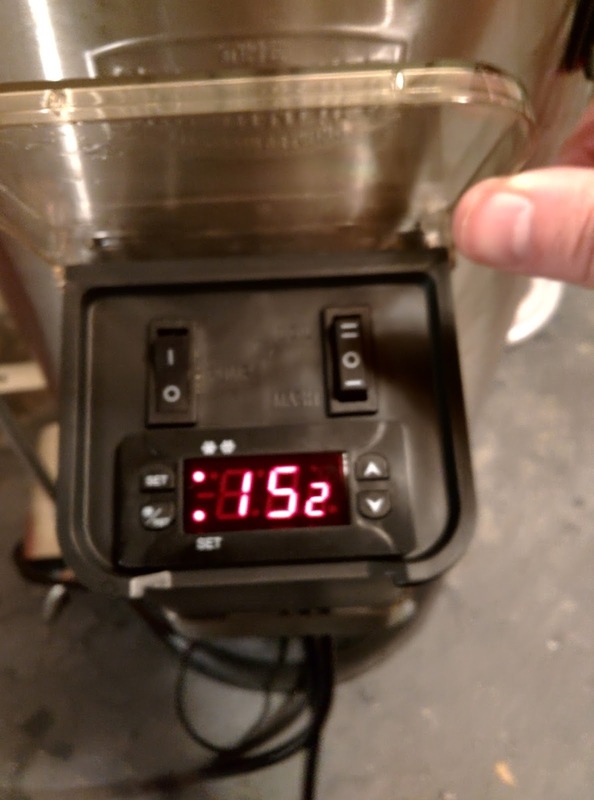 When I first got The Grainfather, I was frustrated with it. In part, this was because I had based my expectations on reviews of the non-US version of the device, which has a lot more wattage and voltage flowing through its heating element. It could heat mash water a lot faster than mine and get the wort to a much more rolling boil a lot more quickly. 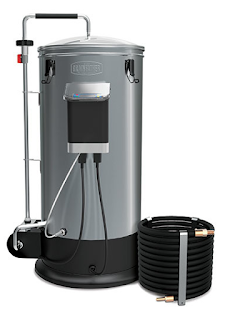 In experience to date, the US version of The Grainfather takes about a minute to heat a five-gallon load of water or wort 1 to 2 degrees Fahrenheit. So heating mash water from my current (January 2016) tap water temperature of 57F to a typical mash temperature of 151F (a 94F change) takes anywhere from 45 minutes to 90 minutes. If you compare that to the 240V 2000-watt European version, it's quite a bit slower. This often means that my total elapsed time for a batch of home brew is anywhere from 6 hours to 8 hours, including prep and cleanup. This is quite a time investment for five gallons of beer. Enter "The Graincoat" accessory. This $50 (plus shipping) product is sold by iMake. It wraps around The Grainfather's kettle during mashing and boiling, and is designed to help hold the heat in. To be perfectly honest, I didn't hold out much hope that it would make a big difference. Out of the package, it feels relatively thin and flimsy, though paradoxically well made. It's basically a big foam insulator that wraps around The Grainfather and holds together with hook-and-loop (e.g., Velcro) fasteners. To install The Graincoat, you must first remove the temperature controller, pump cord, heating element cord, and temperature probe cable. Then, you position The Graincoat in place and wrap it around the kettle. Once you have it in position, you make it fit snugly and connect the fasteners together. Then, you reinstall the control box and reconnect all the cables. This sounds a lot worse than it really is. I think it maybe took me about five minutes to install. Once it is installed, it looks like the picture below. Now, down to the real question. Does it work? In a word, yes. As I write this, I'm brewing a batch of Belgian Tripel in The Grainfather. With The Graincoat attached, I was able to take 5 gallons of mash water from 57F to 151F in about 40 minutes. That used to take me 45-60 minutes. The mash temperature has held much more consistent since I started, which ought to help the enzymes break down the starches more effectively. The result ought to be an increase in brewhouse efficiency. The jury's still out on that. Given a boil temperature of 212F and a mash-out temperature of 167F, I'd expect The Grainfather (without The Graincoat) to bring my wort to a boil in about 30 minutes, give or take a few. With The Graincoat, the boil time for this particular batch was 25 minutes. At 1.5 degrees per minute, going from 57F tap water to 151F mash temperature will take approximately 63 minutes. At 2 degrees per minute, that drops to 45 minutes. This saves you about 18 minutes at mash time. Going from 151F mash temperature to 167F mash-out at 1.5 degrees per minute means it'll take about 11 minutes. At 2 degrees per minute, it takes just under 8 minutes. Going from 167F mash-out to a 212F boil takes 30 minutes at 1.5 degrees per minute. At the improved 2.1F per minute rate, it's just over 21 minutes. So for a single batch, The Graincoat reduces your wait time by about 30 minutes over the entire batch. That's a good chunk of the time it takes to brew a batch of beer with it. Given that I'm typically brewing a batch or two a month, that's at least 6 hours of brewing time (enough for another batch) saved in a year. That's well worth the $50 asking price, I think. 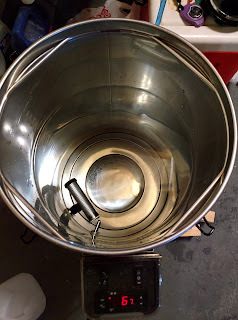 In Part 1 of this series, I introduced The Grainfather and discussed how to use it for mashing and sparging. 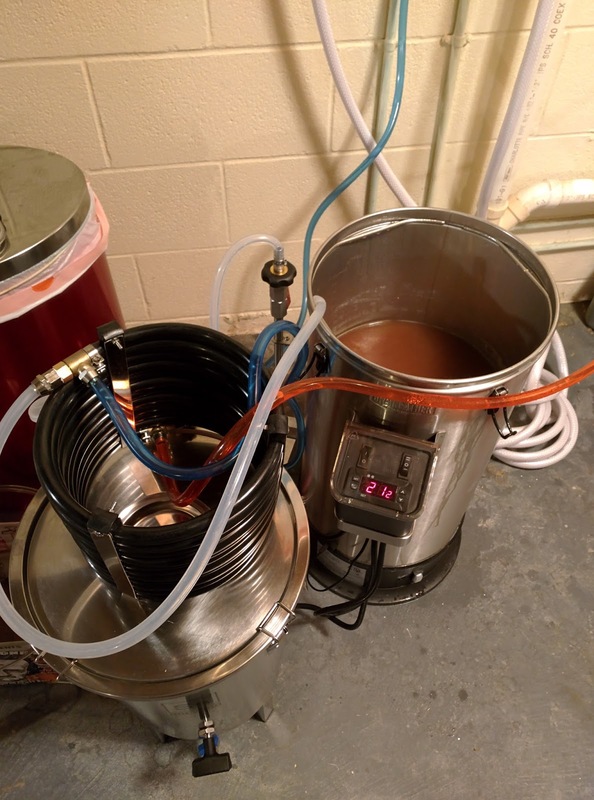 In Part 2, we talked about boiling and chilling the wort with The Grainfather and its included counterflow chiller. In this final segment, we'll discuss cleanup and overall thoughts about the device and its usage. Once you've pumped the wort from The Grainfather into your fermenter and pitched your yeast, you're well on your way to a delicious batch of homebrew. Unfortunately, you've still got some cleanup work to do. At the end of the brewing process, there will be hops bags (if you used them), grain and other residue, and usually some leftover wort in the bottom of The Grainfather kettle. Cleanup will involve clearing out all this! I'll begin by removing the bags and anything I can easily scoop out of the kettle and tossing that away. Then, I'll hose down the inside of the kettle with my food-grade hose. I'll dump this into the sink and down the drain. Then, I'll fill the kettle with about 3 gallons of water and 3-5 ounces of Powdered Brewer's Wash (PBW) and set the controller to heat the water to 130F. As the water heats, I'll use a green scrubbing pad and/or sponge with the PBW to clean off any residue inside the kettle, especially on the area where the heating element is found. (The blackest area in the above photo shows you where the heating element is. Once I've scrubbed things down as well as I can get them, I attach the recirculation arm and let the pump circulate PBW solution through the kettle. After a few minutes circulating the 130F solution through the recirculation arm, I'll pump the hot cleaning solution through the wort chiller and down the drain. While this is recirculating, I'll discard the grain from the grain basket and rinse it out as best I can over the sink. Then, I'll insert the grain basket into the PBW solution in the kettle. At some point, I'll lift it up and scrub the inside and outside. After all that, I'll turn off the pump, disconnect the chiller, and dump the remaining cleaning solution down the drain. I'll hose off the kettle interior and dump that water. I'll fill the kettle again with a few gallons of cold water and set the controller to heat the water to 130F again. As with the PBW solution, I'll run this clean hot water through the recirculation arm and wort chiller for 5-10 minutes to ensure that all the cleaning solution is rinsed out. Yes, you can actually get it clean again! The remaining items, which typically include the kettle I rest the grain basket in, the stirring spoon, the scale, and various other small containers and bowls, I'll carry up to the kitchen. I'll clean and dry these and bring them back to the basement. All steps considered, it takes me 20-30 minutes to clean up the mess and discard the used grain. The Grainfather is then ready for the next batch. When I'm ready to use it again, I'll typically rinse it once more and pump clean water through the recirculation arm and chiller just to flush it again. This only take 5-10 minutes. The Grainfather has been a good purchase. If you had asked me that during my first 3-4 batches with it, I might have told you differently. Compared with extract brewing on my kitchen stove, all grain brewing with The Grainfather takes a lot longer. I used to be finished with a batch of extract based beer in 3-4 hours (including cleanup). All-grain batches with The Grainfather have taken twice that amount of time, especially if things go wrong in the process (like tripping the thermal cut-out). It's vitally important to review the instructions in the manual every time you brew, until they're a habit. Most of the problems and complaints I had early on were due to my unintentionally missing a step in the manual or doing it incorrectly. Other problems have been overcome with experience and changes in the way I do things (as noted in these posts). My very last batch had only one problem, which was hitting the target post-boil volume and gravity. I believe I can solve that by adding a hop spider to my equipment setup. A kettle with a diameter large enough to hold The Grainfather grain basket. This will allow you to let the basket sit there until you're finished brewing. If you just place the basket on the floor, it'll drain sticky wort everywhere. If you have a sink close enough to your brewing location, you could place the basket there instead. My basement sink is kind of dirty, so I don't like to have my brewing equipment in there if I can avoid it. A hop spider, so that you can easily add hops during the boil and remove them if you need to extend the boil to hit your target gravity. Removing the hops will avoid over-shooting your bitterness target. If you don't have a hop spider, food-safe twine and muslin bags so that you can pull out the hops if you need to extend the boil. A stainless steel fermenter, airlock, and blow-off tube. Although these are more expensive than carboys or plastic buckets, they're much more durable and easy to clean. I've found them worth the investment. The stainless fermenters are also not breakable and probably lighter than their glass counterparts. A crude wooden stand made from three pieces of framing lumber in a "U" shape, on which to rest The Grainfather when in use. If the thermal cut-out triggers, you can easily reach under the unit to reset it, rather than having to tip it full of boiling hot wort and reach under it. Although I've not had the opportunity to brew with a Picobrew Zymatic, I have to admit that I've wondered whether that device would have been a better fit for my brewing needs. I would love to be able to measure the ingredients, put in the recipe, and leave the machine to it. The repeatability would be great, too. On the other hand, that device is more than twice the price of The Grainfather and reportedly can't handle grain bills quite as large. The Grainfather can handle a grain bill of up to 20 pounds. The Zymatic grain bins reportedly can't handle a grain load that generates a beer over 7% ABV. That would probably rule out the Tripels and Quads I like to brew. In Part 1 of this series, I explained a little about iMake's The Grainfather RIMS brewing system, walked through the mashing and sparging steps, and shared some recommendations. In this post, we're going to talk about the boiling and chilling steps. Being a 120V 1600-watt electric device with a standard US 3-prong electrical plug, you can use The Grainfather indoors provided you aren't in such an enclosed environment that the escaping steam will cause you problems. I'm able to brew in my basement without any need for fans or other ventilation. In a small apartment kitchen, I can imagine that the steam might condense on the walls or ceiling and cause an issue - but that's only speculation on my part. When you've finished the mashing and sparging effort, starting the boil is a simple activity. You remove the grain basket from the kettle, then switch the heating element mode switch from Mash to Normal (if it's not already set that way). 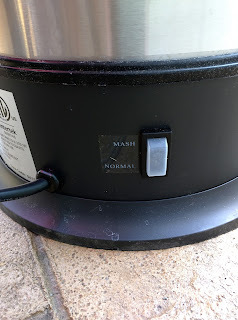 With the heating element in Normal mode, you'll switch the temperature controller to boil. Now, you'll watch the temperature display on the controller to see when it reaches approximately 212F (the boiling point). 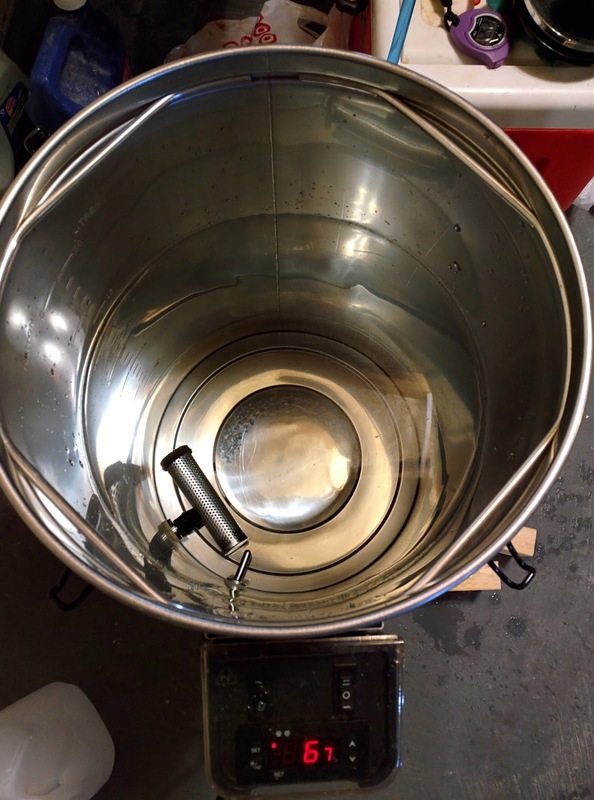 The Grainfather's boil is a rolling boil, but depending on other heating elements you may have used in the past, you may note that it's not a particularly turbulent boil. Despite that, I've had no issues with the beer coming from The Grainfather so I don't see the lack of an overly turbulent boil as an issue. If you're not planning to babysit The Grainfather during the boil, I recommend two things. First, get some Fermcap-S or a similar product to break down the foam on the top of the kettle. If you don't do this, boil-over is a very real possibility as the foam rises during the early part of the boil. This doesn't happen for me with a few drops of Fermcap-S. The other recommendation is to at least check the temperature on the boil every 10 minutes or so. 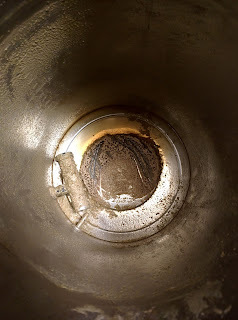 If you ended up with a lot of residue flowing out of the grain bed into the bottle of the kettle, there is a very real chance that you'll end up with scorching. If that happens, The Grainfather's anti-scorch protection will kick in and cut off the electricity to the heating element. 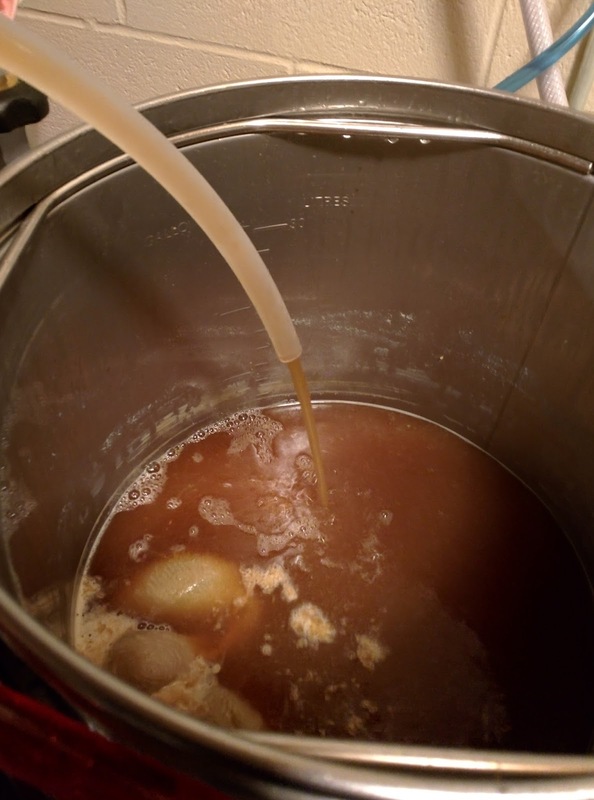 Your wort will start cooling down and stop boiling, which can mess up your beer. Attaching the recirculating arm and turning on the pump can reduce (but not eliminate) the chances of this occurring. The Grainfather's iOS and Android apps contain timer functionality that will help you schedule the addition of hops, spices, adjuncts, etc., into the boil. In the last 5-10 minutes of the boil, you'll need to attach the counterflow wort chiller to The Grainfather and recirculate boiling wort through the chiller and back into the kettle. The purpose of this is to sterilize the wort chiller and reduce the chance of infection when you pump the wort into your fermenter after the boil. Once the boil is complete, you're ready to begin chilling the wort and pumping it into your fermenter. The Grainfather includes a counterflow wort chiller. This chiller is hands-down my favorite feature of The Grainfather. With a tap water temperature of 68 degrees, boiling wort will come out the other end of the chiller in the upper 70's. With colder tap water like we see in the winter here in Ohio (52F the last time I measured it), wort comes out in the mid-to-upper 60s. This makes for practically instant chilling! My immersion chiller on its best day managed to chill 5 gallons in 40 minutes. The Grainfather's counterflow chiller does that in about 15 minutes (and the wort is pumped into the fermenter in the process, where I had to perform a gravity transfer with my immersion chiller and kettle). Sometimes, the wort you get out of the chiller isn't cool enough for the yeast you want to pitch. When this happens (and although iMake doesn't really encourage it), you can recirculate the wort back into the kettle until the kettle temperature drops significantly. Then you shut off the pump, move the hose to the fermenter, and pump into the fermenter. During the summer, wort came out of the chiller at about 78F, which was too hot for the yeast I was using. I recirculated the wort into the kettle until the kettle temperature hit 130F, then began pumping into the fermenter. This time around, my wort temperature was more like 66F, which my yeast tolerated well. I really didn't start measuring my efficiency with The Grainfather until the last batch I did. On that batch, I measured my pre-boil efficiency at 77.43%. That's right in the ballpark for most published recipes which are based on a 75% efficiency. So far, iodine tests have always indicated that conversion was complete (or as complete as the test can measure) at the end of mashing. Provided you haven't gotten too much sediment into the bottom of the kettle during mashing, the boiling and chilling steps with The Grainfather are usually the easiest parts of brewing with it. The boil is rolling but not dangerously so. The chiller is fast and efficient. A problem I'm still wrestling with is that of reaching my desired post-boil gravity. The biggest issue for me in this area is to avoid over-bittering the beer. As you know, the longer you boil wort with hops in it, the more bitter the beer will become. If you reach the end of a 60-minute or 90-minute boil and your gravity is too low (and your volume too high), the best solution is to remove the hops and continue boiling until you reach the gravity target. I've been using hops bags to reduce sediment in the kettle. Invariably, these fall to the bottom of the kettle near the end of the boil and I can't retrieve them. Not wanting to over-bitter my beer, I usually have to just settle for the lower gravity or toss in an adjunct to raise the gravity. I'm planning to build or buy a "hop spider" before I brew my next batch, so that I can remove the hops if I need to extend the boil time. This should allow me to hit my gravity target without winding up with an over-bittered Tripel, Dubbel, or similar beer.